Will bicyclists DIE because Tesla Autopilot won't see them? 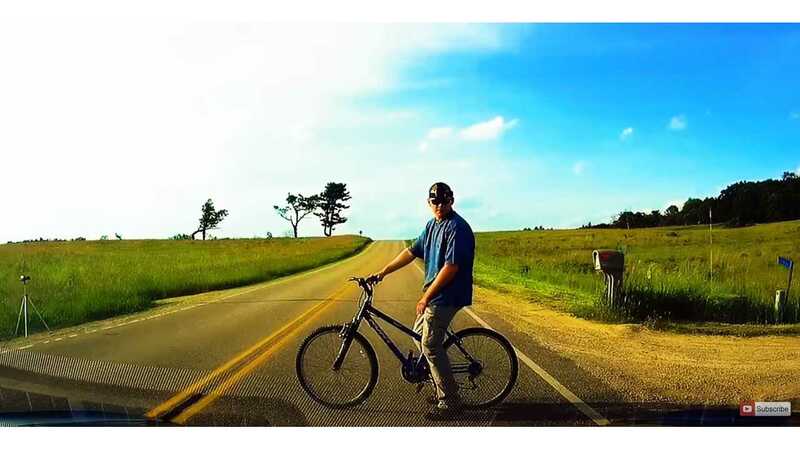 Our good friends, KmanAuto and past InsideEVs contributor, Mike Anthony, are at it again, but this time it's with a bike. Not long ago, a Stanford University researcher, Heather Knight, published a controversial Tesla Autopilot review entitled "Tesla Autopilot Review: Bikers will DIE" . Of course these two had to put Mike's life at stake to see if Knight's title is accurate. Editor's Note: Please do not try/attempt anything you see in these videos yourself, as it is not something InsideEVs' would suggest to do. Mike rides a bike right in front of the Tesla Model S multiple time, for a series of tests. The tests are run from 18 mph up to 30 mph. The Tesla Model S has the first-generation Autopilot system and firmware 8.1 (17.11.10). The tests cover human on bike, bike alone, moving bike, stationary bike, bike perpendicular to the car, bike facing the car, and bike traveling in the same lane with the car. Check out the video and Kman's notes below to learn about their findings, and to see if Mike survived. SUCCESS It detected and stopped for a bike in the middle of the lane. Though, it saw the bike as a "Car", most likely due to it being long ways in the lane, the width reflects back to the radar more so like a "Car" then a bike. SUCCESS This time, even though I was quite far back when I activated Autopilot, it detected the bike so quickly & soon that it wouldn't even let the car get to the set speed of 25mph. SUCCESS The Tesla's Radar saw Mike & bike, and stopped for him. It appears due to the bike being Long-Ways in the lane, between the Radar & Camera, it had detected at distance, however, became "Unsure" of itself once stopped. Tesla's are programmed on the side of caution, as such, required driver to check for vehicles & people before resuming. SUCCESS & Partial Fail Interesting Result! Somewhat expected though based on our tests from last year. The Tesla Model S slowed down, and followed Mike. Once Mike moved over to the shoulder of the road, the car attempted to resume it's course and speed. Unfortunately, at this point, the radar could no longer see the Bike and the Side Sonar did not appear to detect it quick enough before Driver took over, and could have resulted in a Minor hit. Though, also note, We are testing using the old Autopilot 1.0 Hardware. 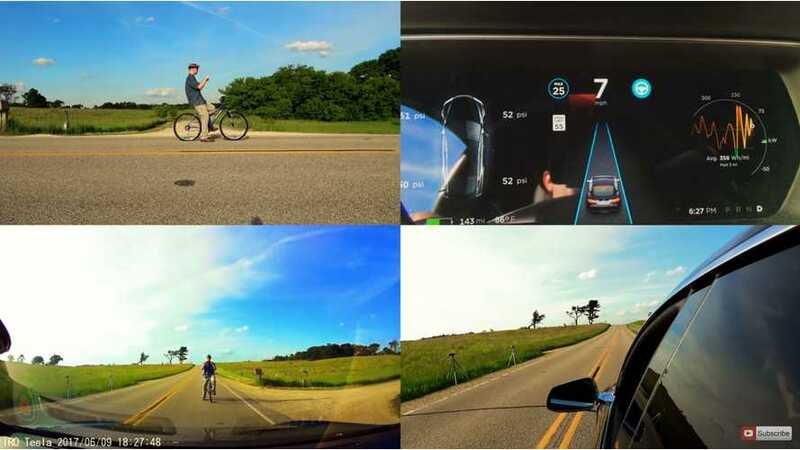 Autopilot 1.0 Sonar has a maximum range of 4ft (1.22 meters), where as Autopilot 2.0 hardware (What is being used currently in Tesla Production for Model S, X, & 3) has a range of 8 ft (2.44 meters) may be enough to have detected the bike from the side. Also, hardware 2.0 incorporates the use of 8 cameras giving a 360* Visual to the computer, where as autopilot 1.0 only has a single forward facing camera. PASS/FAIL Pass = The Model S detected the bike and slowed the vehicle down. Fail= Vehicle did not bring itself to a complete stop. Instead of a complete stop, the Autopilot Panicked and sounded collision alert. In this case, the swerving "drunk driving" of Mike, brought him in and out of the radars detection zone. As such, when the car was too close to maintain a lock on him, sounded the collision alert for driver to take over. Complicated I, as the driver became nervous. I touched the steering wheel, result, deactivating autopilot. However, after touching the steering wheel, Autopilot deactivates and becomes TACC (Traffic Aware Cruise Control). TACC is similar to Autopilot, only does NOT steer the car. It can still bring the vehicle to a complete stop and activate collision avoidance. In this case, TACC slowed the vehicle down until the bike was clear of the vehicles path, then the car resumed it's speed. Mixed Emotions The car did see the bike last second, and did attempt to slow the vehicle. However, it did not do so quick enough. The car COULD detect the bike at a far enough distance away, however, it took too long for the car to be able to determine if the bike was going to cross paths or wait for the car to pass. By the point it made a determination, Accident Avoidance became Accident Mitigation, or in other words, the car did it's best to reduce the damage that would be caused from a inevitable collision. or asleep. Used as designed, it will SAVE lives.